Oh my gosh – one of my favorite soups. I made this today because my son spied a beautiful bunch of asparagus at Wild by Nature. 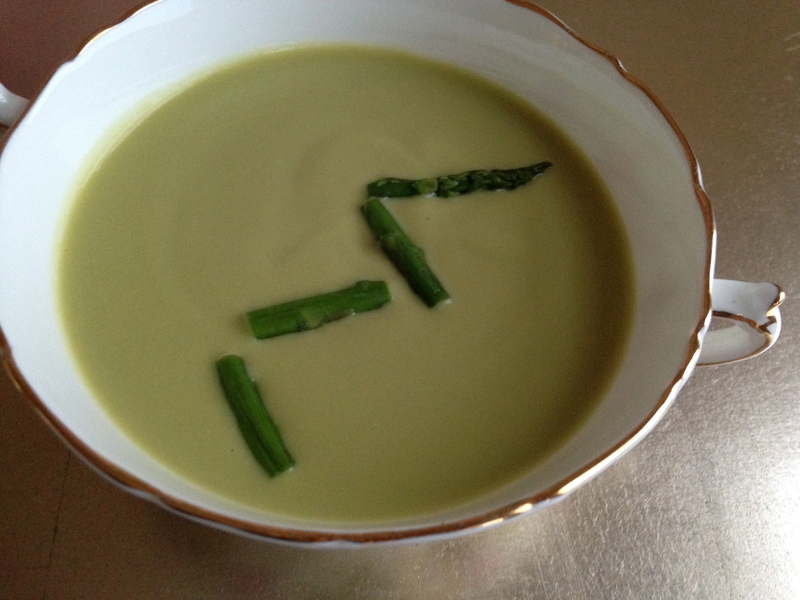 This soup is so easy and asparagus-y – you won’t believe it! Hold one piece of asparagus and break the bottom off. That natural break is where the rest of the asparagus should be cut. Line them up and cut off the stems. Chop them up but save a few for garnish! Steam the asparagus until they are bright green. Set aside. Rough chop the onions and garlic and cook in a soup pot with a little bit of water until they are softening. Add the asparagus, water and cashew milk and bring to a boil. Cook on a low flame for 5 minutes. Watch the pot so the liquid doesn’t boil over. Take off the heat. Use a blender or Vitamix in order to blend completely. An immersion blender will not work here. Take your time with this so the soup ends up really velvety and smooth. Serve garnished with an asparagus spear. Enjoy!